Joining an OCD support group can have several benefits. Many OCD sufferers find it helpful to spend time with people who have the same or similar OCD symptoms. One of the major advantages of joining an OCD support group is the ability to get advice and support from people who are in the same position as you. It is often embarrassing to discuss OCD symptoms with those who do not have OCD and therefore do not have much understanding of the disorder, but a support group can provide an opportunity to discuss your symptoms without fear of being judged or feeling humiliated. 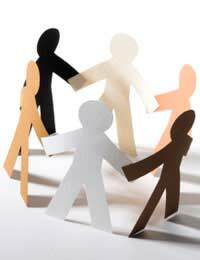 Support groups tend to be local, which gives you the chance to meet OCD sufferers in your area. New friendships are often forged as a result of attending local OCD support groups. User led support groups – These are often run by OCD sufferers with personal experience of the disorder. They are keen to pass on their experiences of living with OCD to help other members of the support group. In some cases, user led support groups may be run by carers, who also have experiences of OCD (albeit from caring for someone who has the disorder). This type of support group is intended to offer mutual support for its members. Professionally led support groups – These tend to be run by mental health professionals such as Psychiatrists, Clinical Psychologists, Counsellors or Social Workers. They can offer a different type of support in comparison to the user led support groups as they are often based around group therapy. Whereas user led support groups are often free, professionally led support groups usually require you to pay some money towards the cost of hosting the meetings. The OCD-UK website has a list of OCD support groups across the UK. There are also details of how to make contact to become involved with your nearest support group. Most OCD support groups meet on a monthly basis, and meetings will usually happen at the same time every month. Not all support groups will be open to carers and family members, so it is worth checking this if you want to bring additional people to the meetings. Some OCD support groups cater for certain demographics. For example, some support groups cater for male OCD sufferers, while some are only open to those aged over sixty. If you want to join an OCD support group without leaving the house, there are online support groups that you can join to interact with fellow OCD sufferers. One example of this is OCDTribe, which is an online community for OCD sufferers around the world to share advice and support each other. Joining an OCD support group gives you an opportunity to mix with fellow OCD sufferers who are going through similar experiences. Attending your first support group meeting can be daunting, but many people with OCD find it extremely helpful to see that they are not alone.